Inspired by a memory of someone I met in my dim distant past, when I recently chanced across the track Stainsby Girls by Chris Rea (circa 1985). I fell in love with a Stainsby girl. Overall, 106mm high x 114mm across. 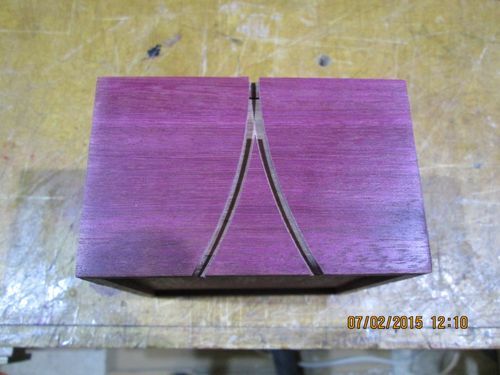 Box, 102mm long sides x 64mm high. Legs (laminated 3×1mm) 9mm x 3mm, radius 127mm. Handles (laminated 3×1mm) 9mm x 3mm, radius 27mm. 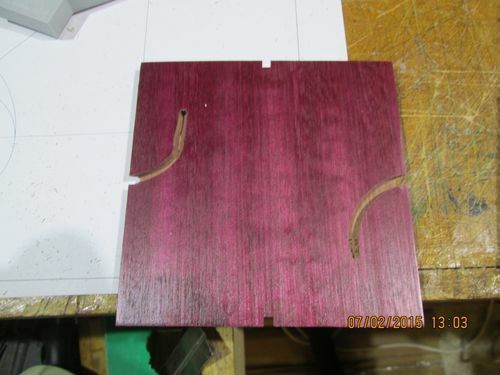 Materials – Purpleheart and Pau Amarello. Adhesives – PVA and Viscous CA. Finish – Spray Satin Acrylic. 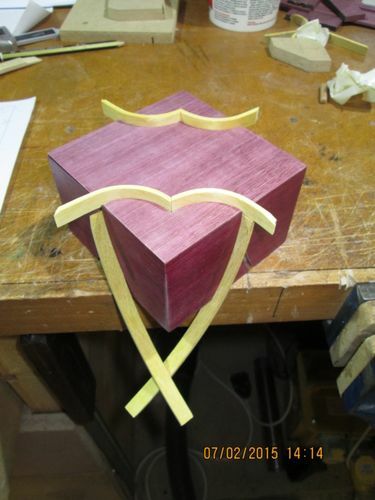 The leg and top details (lid handles) are set in a 3mm wide and deep routed groove. Not sure how many more I can make with Pau Amarello. Its dust sets off rhinitis in me and there are two days of hell after I work it. Your patience is exceeded only by your creative talent. Beautiful!! love the legs! I can envision them on many shapes..super!! I like your move into the exploration of different leg treatments. The boxes themselves seem simple (although they are not so simple) and let the legs take centre stage. Maybe this series could be called. Martyn’s Chorus Line. This one is awesome. The lines and the color contrast make for a very striking result! Would the dust risk be helped with a high quality mask? Very nice! Chorus line, indeed, but I personally think that this one looks like a crown, with the purple and golden colors. Martyn…..maybe it’s just me, or that Valentine’s Day is coming….but in the first picture, the legs form a pretty neat heart. Beautiful color combination, design, and craftsmanship. This is another great piece and a continuation of your excellent creative talent. Hearts are what I saw, as well. Beautiful, Martyn. Thanks for sharing.